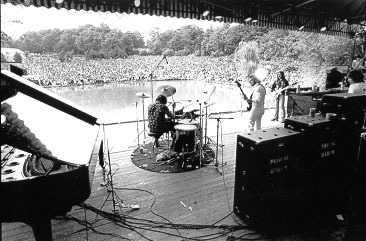 27 July 1974 : Procol Harum at Crystal Palace Garden Party. 27 July 1974 and it was a lovely summer's afternoon at Crystal Palace Garden Party. It was a Rick Wakeman concert but I was here to see Procol Harum for only the second time. We'd sat through some reasonably good (but not brain-expanding) stuff from the lower order of the bill before Procol arrived. They cracked along with superb versions of Butterfly Boys (I wish they'd play this more often), Bringing Home The Bacon, Cerdes etc. My memories are of an extended Shine On Brightly with Mick Grabham putting in a guitar solo after the third verse and Power Failure with BJ filling the skies. Wonderful stuff. All of a sudden they were gone and the crowd called out for more. There was something in the air (so to speak) as if people just believed an encore of AWSoP was forthcoming. Procol had the reputation in those days of not doing it. This was the second time I'd seen them and still hadn't heard AWSoP. They didn't come back. Regrettably Leo Sayer DID come on and in the space of five seconds became the most hated person at Crystal Palace (remember nobody knew of Jeremy Beadle in those days). 'Lack of time' was the critics' explanation for no Procol encore. Never mind it was a super concert to build our hopes upon. Nice to see you all at Manchester!